With hundreds of online casinos around, you might end up in a maze while looking for a reliable place to enjoy your favourite online casino games. 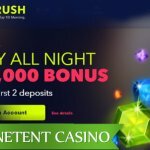 Luckily, there are websites such as NetentCasinos.com to guide you and today I would like to emphasize a unique brand I added a few months ago called NightRush Casino. Are you a night owl and interested in a €1,000 welcome bonus and a weekly 50% Weekend Reload Bonus, you better keep on reading. Truly unique, this brand is specially designed for the night owls out there, but obviously, all type of players are welcome to join the generosity of this NetEnt Casino. This generosity can be found in their welcome bonus, but also in their weekly bonus. 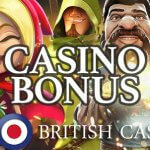 Before I’m going to tell you everything about the royal online casino bonuses at NightRush Casino, there are a few other things I would like to mention about this NetEnt Casino. 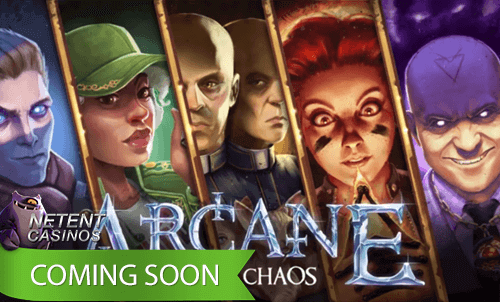 The incredibly wide range of online casino games, for example. 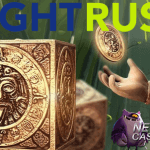 NightRush brings you the games of nine different suppliers including the entire suite of NetEnt Games. With games from so many online casino suppliers, there’s no chance you’ll ever get bored. Besides the standard table games, video pokers, slots and video slots, you’ll also have access to a Live Casino where Live Dealers will be waiting for you at the tables. 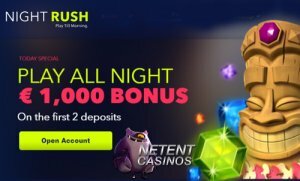 If you’re looking for a unique brand to spend some of your spare time, NightRush Casino is definitely a brand to keep in mind with one of the largest range of games while having a focus on those players who enjoy playing during the night. While all online casinos are open 24/7, NightRush Casino takes it a step further and the first thing I’ve noticed the ‘night clock’, different than the usual digital clock. This clock is ticking back, and instead of telling you the exact time, it tells you how many hours and minutes there’re left until the sun comes up again. When you’re playing during the night and you can hardly keep your eyes open, the bright colours used on this platform might wake you up again. It, for sure, fits the brand, although I do miss a starry night mixed with some moonlight, though, the two things that make the night worth experiencing. A welcome bonus package like this will turn every dark sky into a starry one and will let the sun shine in your account, no matter what time of the night it is. Besides the lucrative welcome bonuses available for you at NightRush Casino, you’ll also be able to claim your weekly Weekend Reload Bonus. From now on, your weekends are sorted with the 50% up to €100 Weekend Reload Bonus. The best thing about this Weekend Reload Bonus is that it will be valid between 16:00 CET on Friday until 23:59 CET on Sunday. That’s how your weekend will start early at NightRush Casino!